Today, We are going to announce winners of the giveaway conducted at this blog. In this giveaway we had decided to give three prizes. The following are the details. We have received more than 9000 entries. But Puntab automatically filter SPAM entries and contest ends at 6317 entries. I don’t know how Punchtab starts filtering SPAM entries. After requesting Punchtab sends us details of all entries. After filtering we found following results. We will announce our next giveaway within 7 days. So stay tuned by subscribing to this blog. Give your email to below given subscription box. Now its time to say congratulation to the winners. 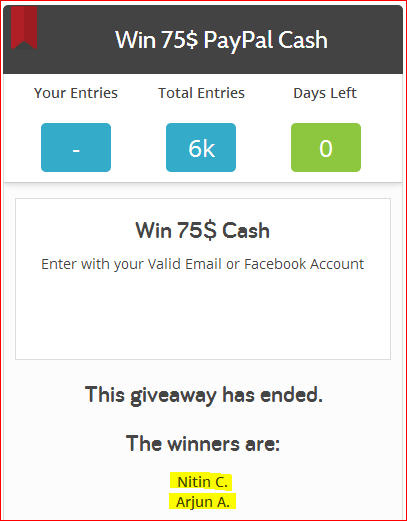 I would like to thanks to participate in this giveaway. And many congratulation to become the 3rd winner. I will process your prize within 48 hours. In the mean time I request you to please choose your required theme by visiting the following link. After choosing your theme reply to the email given in punchtab email you have received. Eagerly waiting to participate in your upcoming giveaways Mubashir. Thanks to participate in giveaway. I see your entries was 139 according to Punchtab given details. Better luck next time. I will shortly announce my next giveaway. Congratulations to all winners i hope next time i can enter on time to stand a chance of winning. Nwosu Desmond recently posted…Bing Webmaster Tools – Are you getting The Second Insight? Congratulation! Now the winner is came..! I looking forward for next opportunity. Hey Arjun and Nitin Congratulation ! Mosam Gor recently posted…Super Summer Bonanza Offers on hostings of iPage, Bluehost, and HostGator. Ryan Biddulph recently posted…Why Do You Need to Push Yourself? congo to all winner i will try next time. Wow! this package is very nice thanks for sharing with us Mubashir Bro.